On behalf of SABR's Women in Baseball Committee, I'm pleased to announce the inaugural winner of the Dorothy Seymour Mills Lifetime Achievement Award is longtime umpire and promoter of women in baseball, Perry Barber. Please join us in congratulating Barber for winning this award and thanking her for all she has done for 38 years to promote women’s baseball and create opportunities for women to be a part of the game. Continuing a tradition of female umpires that stretches back to Amanda Clement in the early 1900s, Barber has umpired around the world at every level of the game. No matter where she is, she is a constant champion of women and their participation in America’s National Pastime. Barber will be presented with her award this June at the SABR 48 national convention in Pittsburgh, Pennsylvania. The award will be presented to her by Dorothy Seymour Mills, the woman for whom the award is named. We hope you can join us for this ceremony. SABR's Women in Baseball Committee established the Dorothy Seymour Mills Lifetime Achievement Award — "The Dorothy" — named in honor of Dorothy Seymour Mills and her lifetime of contributions to promoting women’s baseball. This year's recipient, Perry Lee Barber, has been a professional umpire since 1981, umpiring more than 6,300 games to date. She and her twin sister attended umpire school when women were not wanted and her perseverance paid off with her graduation. Barber has umpired at all levels of the game, including Major League Baseball's spring training. Her umpiring has taken her around the world to places such as Japan, Guam, Hong Kong, and the Caribbean. In addition to her own umpiring, Barber has been a tireless advocate for giving other women opportunities to play and umpire. Whenever possible she hires other female umpires for the tournaments she has been involved in, such as Baseball for All Nationals and the Boston Red Sox women’s fantasy baseball camp. One of the young women she brought in to umpire, Emma Charlesworth-Seiler, is now working as an instructor at umpire school and became only the eighth woman to umpire in professionally affiliated baseball in 2017. Barber also conducts umpire clinics, speaks about umpiring and women’s baseball, and serves as a board member for the International Women’s Baseball Center and an advisor for Baseball for All. "Perry Barber embodies the spirit of the Dorothy Seymour Mills Lifetime Achievement Award. 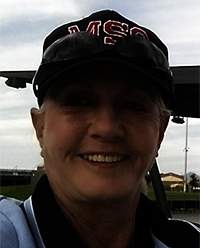 She is a groundbreaker in the world of women umpires as Dorothy was in the field of baseball history research. Like Dorothy, she continues to advocate and support women in all areas of baseball. She is a mentor to many and a friend to many more." "I am very pleased that this first Dorothy honors Perry Barber for her ongoing contributions to the game we love." In addition to Barber, the other finalists for the 2018 award were baseball player and scout Edith Houghton, Canadian national women's team player Ashley Stephenson, and baseball player, coach, and advocate Justine Siegal. To learn more about the Dorothy Seymour Mills Lifetime Achievement Award, click here. This page was last updated February 28, 2018 at 11:13 am MST.